Happy new year Keith (and everyone). Looking forward to 1st frog spawn! All the best for 2018 to everyone. Frog spawn will be a long time away yet for me in East Devon. I had intended to put another pond in the ground last autumn - a shallow one for possible spawners, but never got round to it. I'm not going to play decanting and rearing spawn to frogs this year. It's too much trouble for the results some years. I'm just going to let nature takes its course and see what happens. am waiting with baited breath here - last Winter I cleared the pond after many years of neglect but plenty of frogs turned up to lay spawn. unfortunately some form of airborne pollution killed most of the tadpoles but I was very surprised in Autumn to find the garden heaving with froglets, I guess many more had survived than I thought. I had my first newts in years, as well as slow-worms in the garden for the first time. Hedgehogs numbers were poor, mainly due to fatalities caused by increased traffic on the main road due to road works on the approaches to Dover docks, but there were quite a few late juveniles so hopefully most will have survived hibernation - I released my last one a couple of nights ago who had originally hibernated but had been over-run by ticks and had to be brought in for treatment - I wonder if increased froglet numbers will lead to a decrease in ticks, I would presume frogs would eat them, any ideas? All in all, I can't wait for Spring, so Happy New Year to all! Well done with your garden nature successes Chubsta. Having reared spawn to froglets it is amazing how many one clump can produce -nature's compensation for losses I guess. We had several hedgehogs in the gardens here last summer. Over our years here we've had them some years, but many blank years. Sadly I think most are squashed on the road outside. The gardens are huge and interconnected BUT the hogs will venture onto the road! I thought this year maybe they had done OK as no road squashes near here and then suddenly in November a couple within a few days. That might have been our total visitors for the summer. The numbers are low and it is road kill the culprit. I know the official line is that it is loss of habitat firstly, but here there is plenty of habitat, but unfortunately roads too. 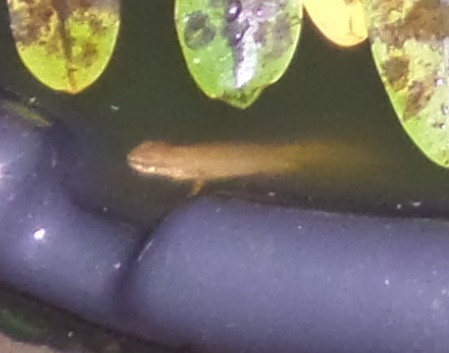 A PS to my other post...after wishing all a good 2018 I went into the garden and was surprised to see a newt tadpole swimming near the surface of the deeper pond, before diving out of sight. I hope it is alright as it seems a bit early to be out, especially in the daytime. Out about 11.30 tonight as it's mild and saw 4 palmates. These two are the best of the poor images I got. One frog, 2 palmates and 2 newtpoles seen in large pond tonight. Seeing the odd frog moving around the pond at night on my cameras, but only one or two. So far this winter there hasn't been any nights when the pond has totally frozen over so although it has been cold for quite long periods with very heavy frosts the daytime temperatures and sunshine must have been keeping the water quite warm. No sign of my newts but I see them so rarely that it isn't surprising, hopefully they are still around. My ponds have frozen over quite a few times. They're in total shade at this time of year so any sun doesn't benefit them.